Following on the heels of Chicago's World's Columbian Exposition, San Francisco's Midwinter Fair sought to have an originality of its own. Unlike the classically-styled main structures at the Chicago fair, which were all white, the Midwinter Exposition's planners designed its major structures in eclectic styles, with a broad spectrum of hues. 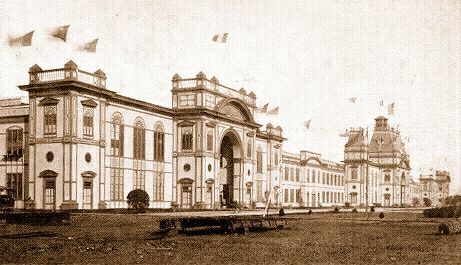 Most of the exhibits and amusement attractions were brought directly from Chicago to San Francisco, in late 1893. A major attraction at Chicago had been George Washington Ferris' 250-foot diameter Ferris Wheel, which stood at the center of the Midway Plaisance. 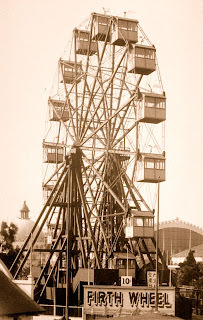 San Francisco sought to have a similar attraction at the Midwinter Fair, so J. Kirk Firth was commissioned to design and build a similar wheel. Firth designed a 100-foot diameter wheel, containing sixteen glass-windowed cars, each of which held ten people. A forty-horsepower engine turned the massive wheel, which weighed 216,000 pounds. Situated on a hilltop in the Midway amusement section, the Firth Wheel became an immediate hit with fairgoers, who paid 10-cents each for two revolutions in the wheel. On April 1st, 1894 the Firth Wheel became the location of the Von Gunther - Schneider wedding, with the bride & groom occupying one car, and their guests in the others. By night, the wheel was illuminated with electric bulbs, arranged in a circle at the inner portion, and a zig-zag pattern around the perimeter. At the close of the fair, the Firth Wheel was purchased by Adolph Sutro, who had it relocated near Sutro Heights and the Cliff House, where riders had an unparalleled view of the Pacific Ocean. The wheel operated at its new site for about 20 years, until outgrowing popularity. The Firth Wheel was subsequently dismantled and sold for scrap. Thanks for the link. I actually used that page for some info about the wheel, besides some contemporary sources. As far as I know, the Firth Wheel was dismantled and scrapped sometime before 1920.